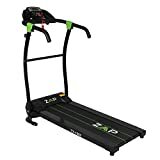 This great value treadmill from ZAAP allows you to enjoy the benefits of running in your own home, and thanks to the folding design, it won’t take up much space when not in use. Rated with a max user weight of 120kg, this is a great running machine for new and improving runners and those who are looking to make real strides towards improving their health. With a maximum speed of 10km/h, and different speed intervals up to that, you can work up to a good jogging speed from whatever level you start at. The 12 built in fitness programs will help keep you motivated and interested.